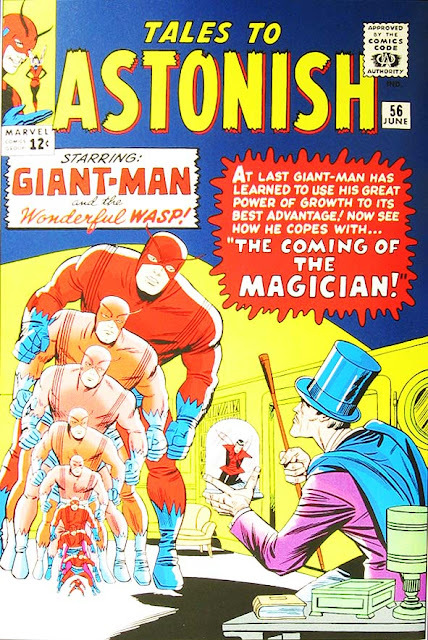 The cover proclaims: "At last Giant-Man has learned to use his great power of growth to its best advantage!" Is it unfair that those beginning words, "at last", are what I key into the strongest? Or, given the bumbling and bungling we've seen from him recently, is it entirely appropriate? Either way, any indication that Stan might have been noticing the problem is an encouraging one, and fortunately the cover pronouncement is not empty hyperbole. For the first time, this adventure sees Hank switch between his various sizes - ant-sized, giant-sized, and normal - at the drop of a hat, whenever the situation requires, and often back and forth in rapid succession. 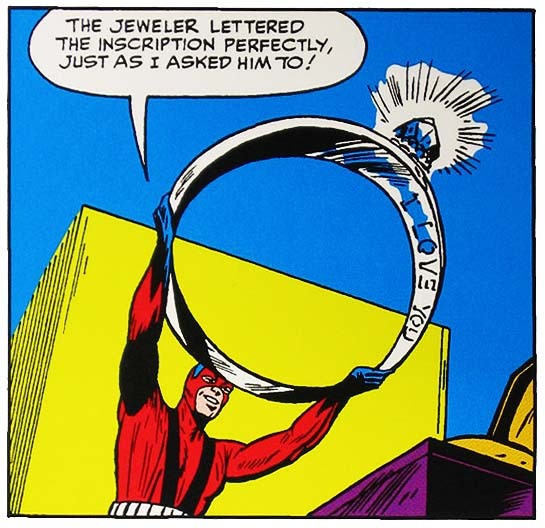 While the sight of a superhero rapidly popping pills (oh, alright, growth and shrinking "capsules") might seem a bit odd, the effect is nevertheless a display of competency that's quite unusual - for Hank Pym, at least. This guy's gotta be a joke, right? Tell me he's a joke. 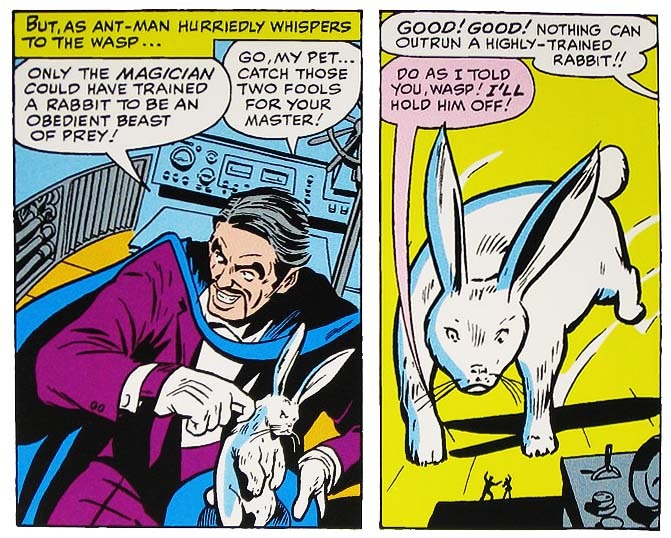 Then again, if Pym had fallen flat against a villain as lame as this, the readership may have never forgiven him. You see, this time out Hank & Jan face the villainy of ... The Magician! Specifically, the kind you hire out to parties. No, I'm not kidding. 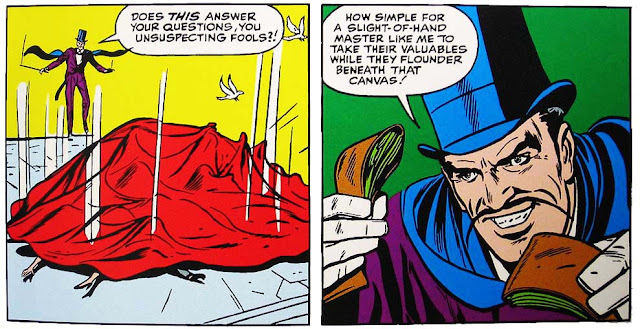 Robbing his audience of their cash and jewels, he possesses no superpowers apart from the ridiculousness of Stan's Goofy Silver Age Writing. For instance, he can vanish objects by means of a suction-powered cane. He appears out of nowhere because he's lowered by a blimp - one which, since it's painted blue, is completely invisible against the sky. Etc. He'll be back very briefly in a couple of months, then never heard from again. It's not hard to see why. Awww. That little Ant-Man looks so proud of himself! Meanwhile, Hank & Jan's relationship shows signs of real progress, as Hank has gone out and bought an engagement ring. In typical sitcom fashion, however, Jan (fed up with Hank's lack of advances) drops a few hints about another suitor designed to make Pym jealous ... but instead he gets discouraged and talks himself out of it. By the end of the tale, they've admitted their feelings to each other, and hopes are high - and yet it will still be five more years until the two finally wed, and only then with supervillains, trickery and a bout of mental illness to boot. I love how that ant keeps trying to signal Pym while he wallows. "Quit moping, Hank! There's crime to fight!" Finally, "The Wonderful Wasp Tells a Tale!" concludes with a story told not to orphans or wounded veterans, as before, but to Hank himself. Continuing the theme of marriage, her tale involves the laidback dude of a far-off world in love with a princess, and the feat he has to perform to win the blessing of the King who stands in their way. Cleverly, Janet uses the opportunity to pull a Scheherazade, suddenly stopping short of the conclusion ... until Hank takes her out to dinner at a fancy restaurant. It may be no coincidence that this is the last installment of the Wasp's Wonderful Tales - though not the last Wasp backup strip...! When the villains unleash their pet rabbits, you know they're serious.